The next ties for the big four teams will be on Wednesday, January 23rd, with Botafogo vs Bangu, Vasco vs Volta Redonda, Americano vs Fluminense, and Resende vs Flamengo. RIO DE JANEIRO, BRAZIL – This past Saturday, January 19th, and Sunday, January 20th, saw all four of Rio’s big teams beginning their campaigns for the Taça Guanabara regional cup. The teams garnered mixed results, with both Vasco and Flamengo securing wins, Fluminense having to settle for a draw, and Botafogo suffering a surprise defeat. 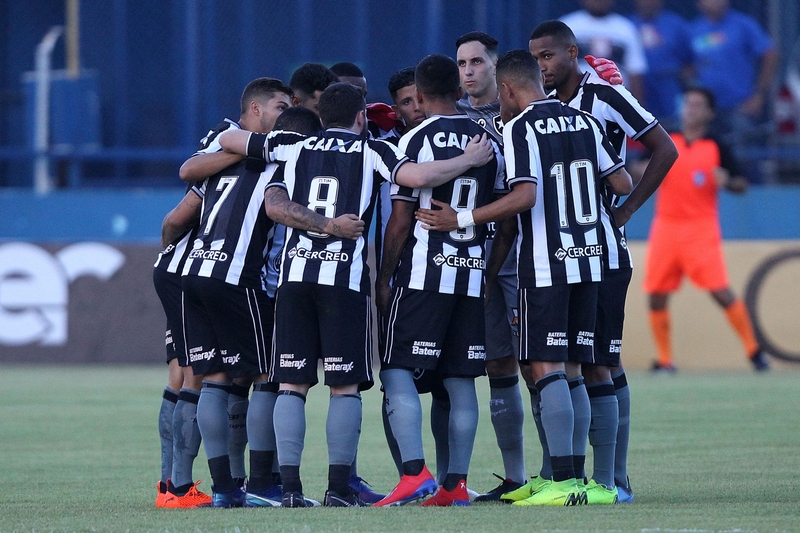 Botafogo have a lot to think about going into their next tie with Bangu, after losing in emphatic fashion to Cabofriense this weekend, photo courtesy of Vítor Silva SS Press Botafogo. The first game of the weekend to get underway was the tie between Vasco and Madureira. In the first half, Vasco had the majority of the chances, with both Yan Sasse, Marrony, Raul and Ribamar all testing the Madureira goalkeeper to no avail. Madureira also had chances, with a header from Claudio Maradona coming particularly close. However, in the second half, Vasco showed their quality and, after the sending-off of Madureira defender Marcelo Alves, the bigger team increased the pressure. After twenty-one minutes, Thiago Galhardo hit a sweet shot and scored the only goal of the tie. At 7PM on Saturday, Fluminense kicked-off their campaign with a tie at the Maracanã against Volta Redonda, in a game that saw two penalties for Volta Redonda plus a late equalizer for Fluminense courtesy of Chilean defender Ibañez. João Carlos converted a penalty for Volta Redonda in the thirty-eighth minute to put the smaller team ahead. And it was the underdogs who were unlucky not to go two ahead when Calazans failed to convert a second penalty within three minutes of the game’s end. However, after a sending-off of Volta Redonda’s Luis Gustavo thirty minutes into the second half, gaps in the defence began to appear, with Ibañez finding the back of the net for a very relieved-looking Fluminense, making the final score 1-1. The second day of the Taça saw Flamengo take on Bangu, also at the Maracanã. Anderson Lessa opened proceedings by scoring for the visitors, Bangu, after only two minutes. However, the visitors’ luck swiftly changed when Felipe Dias was sent off for a handball which also gave away a penalty. Diego converted the spot-kick for Flamengo and things were once again tied after fifteen minutes. Eight minutes into the second half, Flamengo fired home again, with a header from Rhodolfo putting the ball beyond the reaches of Bangu’s keeper. Flamengo then had a super chance to get a third goal when Bangu defender Dieyson bundled over Everton Ribeiro in the box, leaving the referee no choice but to point to the spot. However, even though the shot was struck hard by Diego, Bangu keeper Jefferson managed to guess correctly and leaped to his right to stop the ball going in, leaving the game 2-1 for Flamengo. Fluminense could only secure a draw in a frustrating tie against a plucky Volta Redonda, photo courtesy of Mailson Santana/Fluminense FC. The biggest surprise of the weekend came when Cabofriense managed to thrash Botafogo 3-1. Botafogo scored the first goal in the thirty-second minute of the first half, with Luiz Fernando striking a bobbling shot that bounced crazily past the Cabofriense keeper. The home team responded well and within fifteen minutes, the aptly-named Rafael Gladiator was able to head home a goal just before the break. Botafogo hit the woodwork five minutes into the second half, but it was Cabofriense who made it count, with Anderson Rosa scoring after twenty-nine minutes of play, striking home a loose ball in the area to put the underdogs in front. Botafogo then responded by mounting on the pressure but to no avail, with chance after chance running amiss. With all the team forward, Botafogo’s defense was left stretched, and with virtually the last kick of the game, Rincon sprinted beyond the Botafogo defenders and managed to coolly strike the ball between the goalkeeper’s legs to make it 3-1 for Cabofriense.